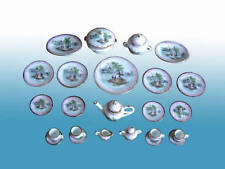 This Porcelain Tea Set is for the 1:12 scale miniature setting by Hansson. These plates are beautifully hand painted. Hansson miniature furniture are considered to be of museum display quality. Every piece is beautifully hand carved and hand painted, with upholstered seats, working drawers and many magnificent details. These plates are beautifully hand painted. Hansson miniature furniture are considered to be of museum display quality. Every piece is beautifully hand carved and hand painted, with upholstered seats, working drawers and many magnificent details. 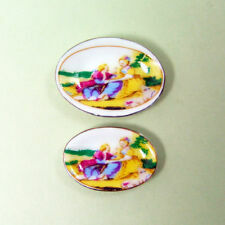 This Porcelain Plates are for the 1:12 scale miniature setting by Hansson. Hansson miniature furniture are considered to be of museum display quality. Every piece is beautifully hand carved and hand painted, with upholstered seats, working drawers and many magnificent details. Those Porcelain Plates are for the 1:12 scale miniature setting by Hansson. Hansson miniature furniture are considered to be of museum display quality. Every piece is beautifully hand carved and hand painted, with upholstered seats, working drawers and many magnificent details. 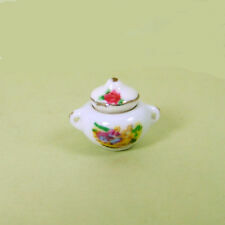 SOUP TUREEN (with Lid) is for the 1:12 scale miniature setting by Hanamini (Hansson). Hansson miniature furniture are considered to be of museum display quality. Every piece is beautifully hand carved and hand painted, with upholstered seats, working drawers and many magnificent details. 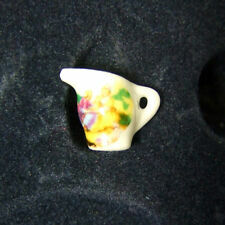 This Porcelain Vase is for the 1:12 scale miniature setting by Hansson. 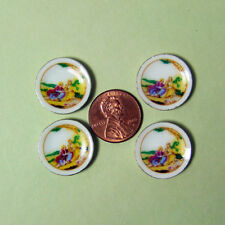 It is 1" Tall and 1/2" wide. The vase is beautifully hand painted. Hansson miniature furniture are considered to be of museum display quality.